The Chinese were already familiar with the techniques of wall-building by the time of the Spring and Autumn Period, which began around the 8th century BC. 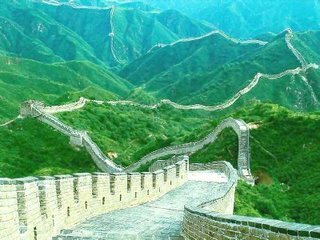 During the Warring States Period from the 5th century BC to 221 BC, the states of Qi, Yan and Zhao all constructed extensive fortifications to defend their own borders. Built to withstand the attack of small arms such as swords and spears, these walls were made mostly by stamping earth and gravel between board frames. Qin Shi Huang conquered all opposing states and unified China in 221 BC, establishing the Qin Dynasty. Intending to impose centralized rule and prevent the resurgence of feudal lords, he ordered the destruction of the wall sections that divided his empire along the former state borders. To protect the empire against intrusions by the Xiongnnu people from the north, he ordered the building of a new wall to connect the remaining fortifications along the empire's new northern frontier. Transporting the large quantity of materials required for construction was difficult, so builders always tried to use local resources. Stones from the mountains were used over mountain ranges, while rammed earth was used for construction in the plains. There are no surviving historical records indicating the exact length and course of the Qin Dynasty walls. Most of the ancient walls have eroded away over the centuries, and very few sections remain today. Later, the Han, Sui, Northern and Jin dynasties all repaired, rebuilt, or expanded sections of the Great Wall at great cost to defend themselves against northern invaders.